How to use Pavtube ByteCopy software for backing up Blu-ray Disc/DVD to MKV files? How to > How to use Pavtube ByteCopy software for backing up Blu-ray Disc/DVD to MKV files? The following guide focuses on how to use Pavtube ByteCopy software, which is a BD/DVD backup tool for users to copy Blu-ray and DVD movies to MKV format with highest quality for playback on PC and HD media players. Movie lovers that would like to make 1:1 backup of Blu-ray Discs may download a trial of Pavtube ByteCopy software and follow the tutorial to create flawless digital copy your BD/DVD. a. Backing up DVD/Blu-ray Disc to MKV files with all audio and subtitle streams. a. Set audio language and subtitles by preference. b. 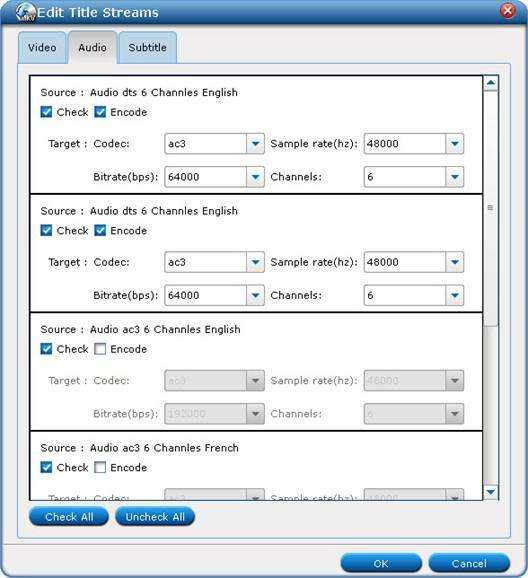 Convert audio tracks and subtitles to fit for your player. c. Create customized output format for shrinking Blu-ray contents. Pavtube ByteCopy Trial version. A trial is free and functional-restricted. Lossless output can be used 3 times only. Pavtube ByteCopy Retail version. A full version is offered at $42 only by Pavtube Studio. Step 1. Click “Load Disc” button to import movie files from DVD/ Blu-ray Disc. Step 2. Click the “Edit Disc” button to select desired subtitles and audio tracks for all chapters. 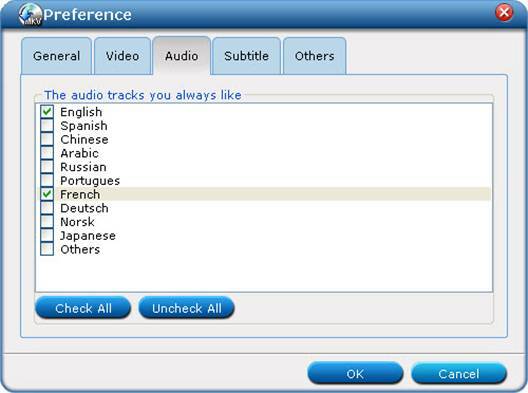 The software keeps all subtitles and audio streams by default. Choose “Lossless” in dropdown list of “Format” box if you’d like to backup Blu-ray video stream without quality losss. Step 3. Click the “Convert” button to start ripping movie to MKV files. In this way Pavtube ByteCopy extracts the main movie with selected subtitles and audio tracks from disc and seals the contents into MKV container without transcoding, which means you get lossless quality MKV videos. 1. DVD-ROM will not read Blu-ray Disc, so you need a Blu-ray Disc drive (either external or internal) for ripping Blu-ray Disc. 2. The Pavtube ByteCopy is able to crack copy-protections of commercial Blu-ray Discs and DVDs, third-party BD decryption software like AnyDVD is not necessary. 3. When playing selected title in Pavtube ByteCopy, the software plays video streams only. There is not audio or subtitle- we can’t decide which to play from multiple audio tracks and subtitles. 4. Best video quality is kept when you choose lossless output. To properly play lossless Blu-ray contents back will require a high horsepower computer or powerful HD media player to support the data rate involved in MKV format- the only format that Pavtube ByteCopy uses. By taking advantages of Preference settings can you save both time and labor. Click “Tools” menu-> “Preference”-> “Audio” tab to set audio language by preference. Check the audio languages you always want to keep. E.g. if check English and French box, English and French audio tracks will be selected for all titles by default the next time you run Pavtube ByteCopy. Set desired subtitles under the “Subtitle” tab in the same way. The settings will be applied to all future discs/movie files until user preference is reset. Things happen when your BD contains high-quality 7.1 audio tracks while your media player/AV receiver plays 5.1 channels only. Pavtube ByteCopy lets you down convert TrueHD and DTS-MA 7.1 audio to AC3/AAC/DTS 5.1 audio and Blu-ray SGS subtitle to DVDSUB for your player. Select main movie Title and click the “Edit Title” button to select and encode audio track streams and subtitle. The “Edit Title Streams” screen pops up with three tabs, Video tab, Audio tab and Subtitle tab. Switch to “Audio” tab to set audio streams. To select an audio stream, select its corresponding “Check” box. Check the “Encode” box if you’d like to transcode audio to a different codec/format. Available audio codecs includes AC3, AAC, DTS, PCM, MP3 and MP2. Set subtitles under “Subtitle” tab in the same way. Available subtitle format is restricted to DVDSUB, which works well on almost all the video DVD combos and HD media players. There are three options for exporting Blu-ray and DVD movie in MKV format, i.e., lossless, HD Player, and Custom. Lossless option lets you creates 1:1 copy of Blu-ray contents without quality loss. HD Player option copies video stream and meanwhile turns TrueHD or DTS-MA 7.1 audio into Dolby Digital 5.1 audios. Custom option allows you to create customized output option for use. Here’re steps to create new output option. 1. Select the whole disc, click “Edit Disc” button to enter “Edit Disc” window. 2. Find the “Format” bar, and select “Custom” from dropdown list of “Format” bar. 3. Click “Settings” button to set and save new output format in “Setting Disc Streams” window. 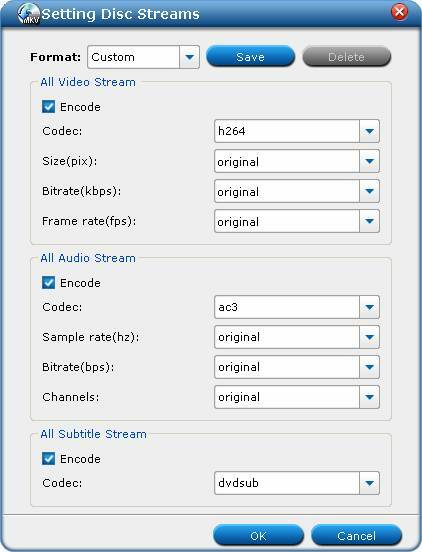 Check the “Encode” box, and set customized video codec, size, bitrate, frame rate, audio codec, sample rate, bitrate, channels and subtitle codec. 4. When everything’s settled down, click “Save” button, give a name to the newly created format, and click “OK”. 5. Click “OK” on “Setting Disc Streams” window and back to “Edit Disc” window. You’ll find that the new format is added to dropdown-list of “Format” bar. 1. By default the video size is “original”. When you make changes to video size, please also check the “Encode” box below “All Subtitle Stream”. When a subtitle looks fine on 1920*1080 video, it might go beyond the screen when the video is resized to 1280*720, so make sure the subtitle is converted as well. 2. Do not set 6 channels for audio when MP3 or MP2 codec is selected. Do not set 1 channel when DTS is set as audio codec. 3. A lossless Blu-ray movie can take up space ranges from 20GB to 50GB. If you want to cut down file size, try setting smaller value in video “Bitrate” instead of using “original”. 4. When H.264 is set for encoding video streams, you may take advantage of CUDA encoding. Follow “Tools”-> “Preference” -> “Others” to set CUDA encoder. 5. In order to play a video clip properly on your device, make sure the video is encoded with proper codec (ByteCopy offers H.264, Xvid, MPEG-2 only) and packed in proper container format (MKV only for ByteCopy) with proper bitrate, frame rate, resolution, audio channels.